After the success of the inaugural ABC comedy night in July 2017, the Trust ran two more nights at the Bill Murray pub in Islington on Tuesday 31st October 2017 and Tuesday 13th February 2018. The October Halloween special featured Evelyn Mok (winner of the Pleasance Indie Award for Best Newcomer), Giants (Writer’s Guild Award Nominees 2018), Georgia Bruce, Barney Iley, and Ken Cheng (winner of the coveted ‘Best Joke of the Fringe’ title at the Edinburgh Fringe). 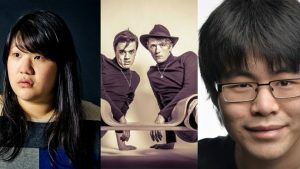 The February ‘Lonely Hearts’ special featured Jamali Maddox (as seen on Live at the Apollo), Lou Sanders (as seen on Alan Davies ‘As Yet Untitled’), Norris & Parker (Guardian Top 10 Comedy Picks 2016) and Alexander Fox. Both nights were ably hosted by sketch duo Moon, who will be appearing at the Edinburgh Fringe festival in August 2018. Together, the events raised over £470 for the Trust. A huge thanks to all the acts involved, and keep an eye out for more ABC nights in the future!